On Thursday, January 24th we have a great event to welcome the year. We are going to HARD ROCK CAFE to enjoy a great evening altogether. So come and enjoy the best international spirit with your fellow InterNations' Members. It's our farewell event as we both, Olga and Juan, are stepping down from being InterNations Ambassadors. But don't worry, we'll stick around and continue as Consuls organizing some great activities in the Afterwork and Classical Music groups. 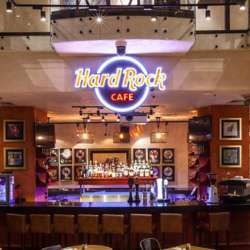 In this Official InterNations Event, we'll be meeting at Hard Rock Cafe, located in the heart of Moscow, near Smolenskaya (line 3) metro station. We'll start things off at 19:30 with some socializing and networking. So don't worry if you are new or coming alone, the Ambassadors will be happy to introduce you to other members. Your entrance fee covers a welcome drink (alcoholic and nonalcoholic) and a special closed area for us, also we will have tables in case you would like to have dinner there. Please register for this event by clicking the Accept Invitation button. Feel free to bring your international friends, but please invite them to sign up to InterNations first. The guest list will be closed at 18:00 on the event day. **Please note that any member who does not register for the event has to pay the "Not signed up fee." ** - this is 1000RUB, and like you, we love it when our Albatross members enter for 200RUB and our Basic members for the discounted 800RUB fee. So don't forget to sign up for the event! Remember the entrance fee is only payable in cash! The venue accepts cash and card for all the other transactions. Registration at the event closes at 23:00, so please arrive until then as the bar starts it's own door management after this time. If you would like to volunteer as part of the InterNations welcome desk or help with taking photos, please contact either Olga or Juan.